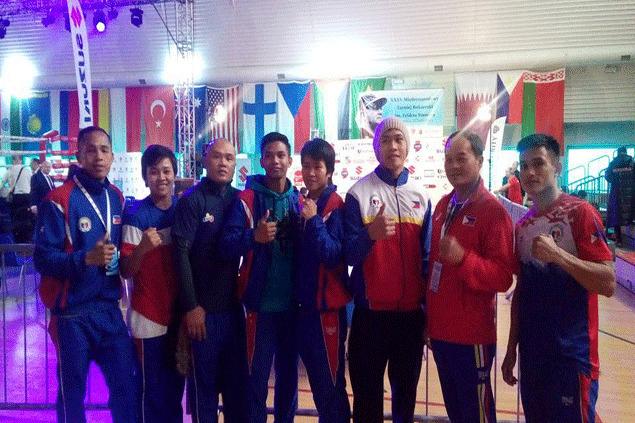 IAN Clark Bautista and Nesthy Petecio punched their way to the gold medal after coming through with rousing victories at the end of the Philippine team’s campaign in the 2018 Feliks Stamm Boxing Tournament in Warsar, Poland Saturday. Bautista, a gold winner in the 2015 Southeast Asian Games in Singapore, proved too much against Zarip Jumayev of Turkmenistan in the final of the men’s 52 kg. finals (flyweight) as the Filipino pug won by a convincing 5-0 victory. “Lumaban noong first round, pero after two minutes lang nakuha na namin yung laro ng Russo,” said head coach Nolito ‘Boy’ Velasco from the Polish capital shortly after Bautista’s dominating win. Bautista was adjudged Best Boxer among 146 entries – men and women – from 21 countries in the week-long meet held in tribute of seven-time Olympian Feliks Stamm, regarded as the father of Polish boxing. Petecio, silver medalist in the 2014 Aiba World Women’s Championship in Jeju City, South Korea, set the tone for the team earlier by whipping Ornella Wahner of Germany for the gold in the women’s 57 kg. class (bantamweight). The 25-year-old native of Davao del Sur effectively kept her German foe at bay by connecting mostly on a jab-straight combination, according to Velasco.